I immediately bookmarked this great site that you can access through your Blackberry, iPhone or less-awesome phone (cough my LG) to get the latest news on foreign policy and the State Department. The site features top stories from the State Department, remarks from Sec. Clinton, her travel plans, daily press briefings and information on every country. Check it out! Today I also discovered (far too late, in my opinion) the Council on Foreign Relations site, which has such great multimedia, hard-hitting interviews and compelling reports on international issues prevalent in the news. 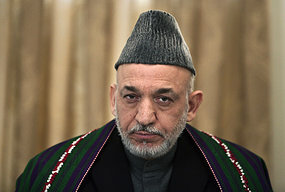 After a summer of attempts to improve relations with the United States and its allies in Afghanistan, Karzai came out today with tough statements against foreign assistance. He said, according to the latest article in the Wall Street Journal, that foreign advisors should be replaced by Afghans. “We hope that NATO countries and the U.S. pay attention,” he said. The Wikileaks files along with the many reports of civilian casualties has lead to anti-American sentiment and overall loss of hope in the country. At the same time, the U.S. has promised to “start” withdrawing its troops and transitioning Afghan security forces by the summer of 2011. That means they committed to another year in the country in terms of security forces. Diplomatic efforts will continue long after 2011, they say. And that deadline, according to Sec. Clinton, is a “working deadline” and could change if circumstances change. Just this weekend, 10 aid workers were killed, piling up the number of Western casualties of the war. The continued violence on top of Clinton’s repeated calls for corruption accountability have essentially diminished the good will we saw when Karzai visited in May. What these companies do, in reality, is provide security for Western diplomats and organizations that provide aid and major infrastructure tools for Afghanistan. The article states that these companies are wary to hand control completely over to Afghan forces, which are often infiltrated by Taliban members. According to Reuters, Congress has approved $345 billion so far to Afghanistan since 2001. Obama has asked for billions more and 30,000 extra soldiers. Will Congress be willing to fund the war when Karzai doesn’t even want foreign contractors there? While Karzai is calling for a withdrawal, TIME, featuring an Afghan girl with her nose cut off, said “What Happens If we Leave Afghanistan.” We have a call for human rights, equality for women and the expulsion of misogynistic radical Taliban law while Karzai is telling the people of Afghanistan that foreign services need to leave. I eagerly await a response from Obama and the State Department. Sec. Clinton held a press conference this morning on the flood in Pakistan that has taken the lives of over 1500 people, left millions stranded and many more missing. “Violence like this is abhorrent at any time, but especially at this time of crisis for the Pakistani people, and I want to convey the condolences of the American people to the Pakistani people on behalf of everything they are confronting,” she said. The U.S. has promised 10 million in aid along with a number of humanitarian groups to provide food, critical supplies and “hundreds of Halal meals.” They’ve also sent boats to help with water purification, search and rescue and the construction of temporary bridges. Clinton also said those wanting to help can text “SWAT” to 50555 for $10 donations similar to how donations were made to Haiti. 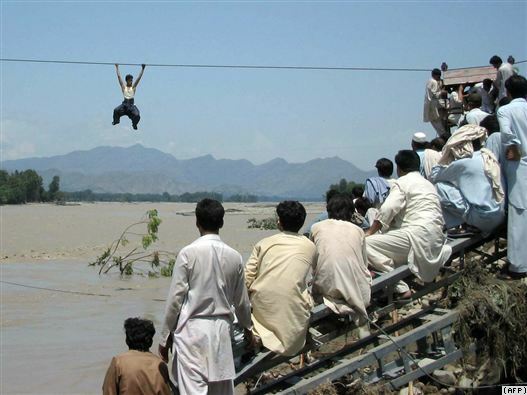 According to the AFP, members of Pakistan’s army have offered to donate one day’s salary towards flood victims. Record rains last week triggered floods and landslides that washed away entire villages and ruined farmland in northwest Khyber Pakhtunkhwa and central Punjab provinces. Her trip reassured the U.S.’s support for Georgia and a warning for Russia, who invaded Georgian territory in the 2008 war. She said the U.S. will support Georgia as a sovereign state and does not recognize Russia’s sphere of influence in the area. Clinton said in a press conference that Georgia could serve as a beacon for democracy in the region. But I thought that was the idea behind the Ukrainian elections?